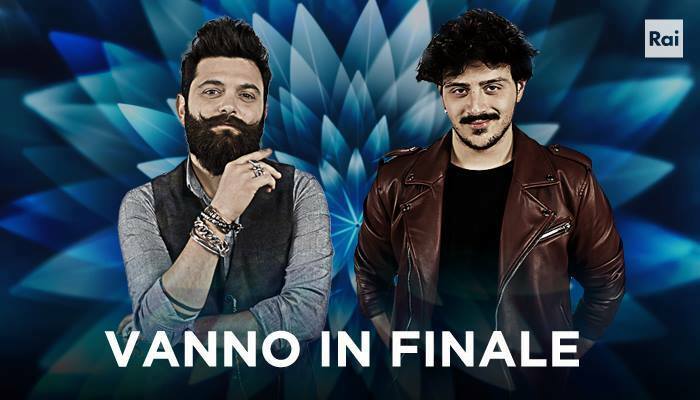 After the second semi-final of Italy’s Sanremo Festival, the list of songs which might represent the country at the upcoming Eurovision Song Contest is completed. Eight out of eleven songs qualified directly to the final, whereas the other three entries still need to compete for their place. 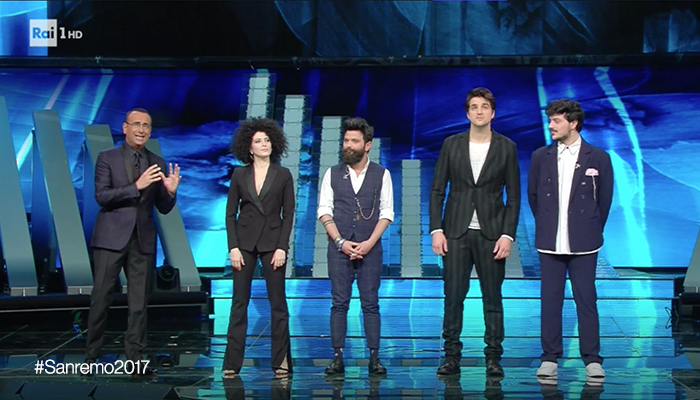 In yesterday’s first semi-final of the Italian Sanremo festival, the two hosts, Carlo Conti and Maria De Filippi, guided the audience through an interesting evening. The first night of the competition saw many interesting international celebrities join the show. These included not only musicians Robbie Williams and Biffy Clyro, but also the actor Keanu Reeves. From the regional stars, the singer Giorgia, famous football player Francesco Totti, actress Sveva Alviti, model Salvatore Nicotra and the comedians Enrico Brignano, Gabriele Cirilli and Flavio Insinna brought variety to the show and made it even more interesting. In her second participation at the Sanremo Music Festival after 2015, the artist competed with a mid-tempo pop song that also contained quiet sections. Towards the end, the song gained power and ended right after an intense climax. The song of the experienced artist, who in 1990 won the newcomers section and in 2004 the Campioni category, can be categorized as a pop ballad that often changes its tempo and intensity. The highlight of the track is a powerful chorus, which is sang by the singer in a very avant-garde personal style. Nesli, who participated in 2015 with the song Buona Fortuna Amore, formed the first duet of this year’s festival together with Alice Paba. Their ballad Do Retta A Te mainly relied on its dreamy atmosphere, conveying a very Italian spirit. 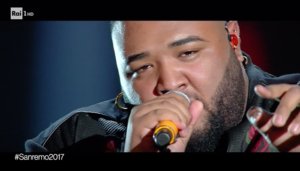 Pop singer Sergio Sylvestre emerged in 2015 as a contestant at the popular Italian talent show Amici di Maria De Filippi. His Sanremo entry is a very emotional, but still powerful, pop ballad, perfectly carried by Sergio’s strong vocals. A strongly appreciated performance by the audience, which clearly confirmed his status as a favourite. The track was originally written in English and then translated into Italian by Giorgia, an Italian musician who performed as one of the interval acts tonight, especially for the festival. In his fourth participation in Sanremo, Gigi D’Alessio competed with a classic ballad in which the experienced artist conveyed his emotions in a very authentic way. Towards the end, the song built up and up and was well received by the audience. After winning the seventh series of the Italian X Factor, Michele participated in Sanremo with a modern ballad that showed off the modern voice of the young singer, but, in contrast to the preceding songs, did not change its tempo and rhythm during its three-minute duration. This will be Paola’s eleventh participation in the Sanremo festival! Hers is a mid-tempo song. She’s got a great voice and this is a catchy pop tune. She joins Mannoia and Mirage in the smart casual trouser-jacket combo. Francesco was the winner of the Newcomers category of Sanremo 2016.The most upbeat song of the night. It’s a catchy, modern pop song that could do well in Eurovision, too. For sure, the poppiest entry in this year’s Sanremo Festival. This will be his twelfth participation in the Sanremo Music Festival. This starts slow and then picks up some rhythm. The song keeps developing, leaving us with a pleasant feeling. After winning the sixth season of The X-Factor, Chiara has already participated in Sanremo. Her first single was composed by Eros Ramazzotti. Her entry is an acoustic ballad. Well performed, but nothing special I have to say. Giulia Luzi is an actress and singer. She rose to fame with her role as ‘Giulietta’ in the musical Romeo e Giulietta. Raige is a rapper. The song is the most different entry of all in this year’s Sanremo. Unfortunately, they sang off-pitch for most of the song. A nice effort from two young artists though. Carlo Conti welcomed the audience at the beginning of the night and introduced the four semi finalists of the Newcomer section of Sanremo. There followed the four young men and women performing their entries live on stage, giving them an opportunity to gain popularity with the Italian music industry. Immediately after the performances, Carlo Conti announced the two finalists: Francesco Guasti and Leonardo Lamacchia. Then, the illusionist Braschi Guasti entered the stage and fascinated the audience with a very modern light and magic performance before co-host Maria De Filippi joined the show. After the first two competing entries, AS Roma football player Francesco Totti appeared on stage, receiving great applause. In a short clip, some of his most famous goals were shown. After more competing songs, Totti again came on stage, responded to some questions and then kicked signed footballs straight into the audience. Yesterday night, we saw Ricky Martin on the Teatro Ariston stage and now it’s time for another superstar. 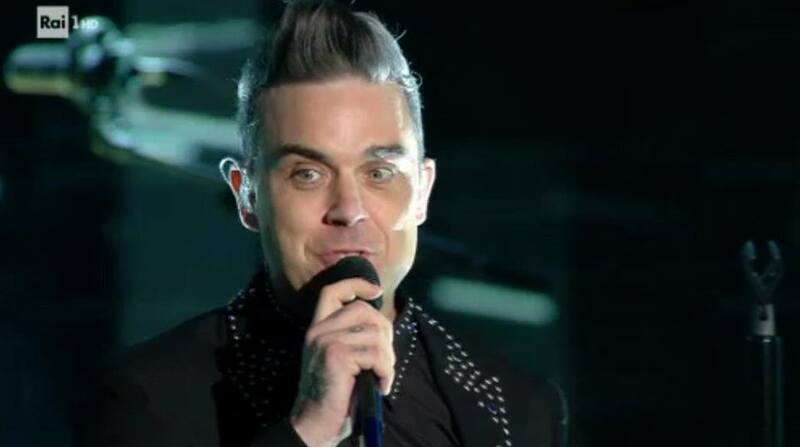 After the seventh festival candidate had performed, Robbie Williams sang a medley of his hits. After the eighth contestant, it was time for Giorgia. Giorgia is a very popular Italian artist whose career started in 1994 from Sanremo and the Teatro Ariston. She sang a medley of her hits, including her winning song in Sanremo, Come Saprei. After some more competing acts, we have Keanu Reeves on stage and an interview with him. After all candidates sang their entries, three comedians entertained the audience while telephone lines were open. A small recap for those who hadn’t voted yet was next but, before we the announcement of the results, Biffy Clyro, a British band, took to the stage. 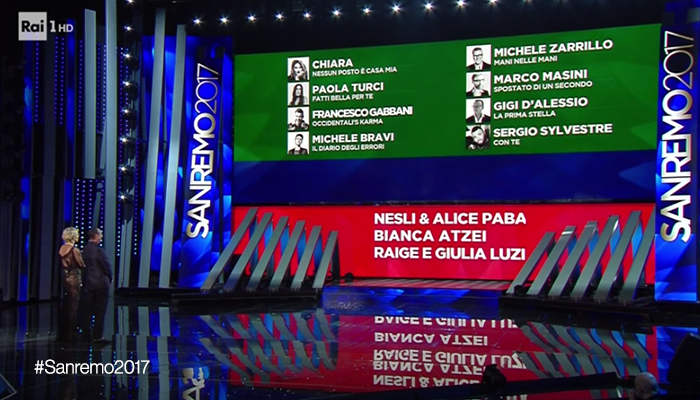 On the first night of Sanremo 2017, the result was determined by a 50-50 split of televoting and the vote of journalists in the press centre of the Teatro Ariston. Three songs from this semi-final are going to compete in an extra show on Thursday evening for a spot in the final. The further eight tracks automatically made it through to Saturday’s final. Since its comeback in 2011, Italy often managed to get a place within the top 10 of the contest. In 2015, the trio Il Volo even managed to win the televoting but could not win overall as a result of a lower place in the ranking of the national juries. Nevertheless, their entry Grande Amore can still be considered the fan favourite of Vienna 2015. In the video below, you can watch the performance of the three young artists. Do you think they should have won? Let us know on social media or by leaving a comment.